Quick'n Brite is the best natural cleaning product available. Unlike most other natural cleaners, this one actually works. In most cases it will outperform both natural and traditional cleaners for hundreds of different tasks. It is incredibly easy to use, and extremely gentle on the stuff you care about. Quick n Brite has the ability to clean tough stains and nasty build-up, but it will never harm your skin or effect any surface you apply it to. You don't have to worry about toxic fumes, and you will always have the confidence that you are using a phosphate free cleaner that produces great results, but is also friendly to the environment. Because we know that you want to start cleaning as soon as your order arrives, each container purchased will come complete with a free scrub sponge to get you started. Quick 'n Brite is an all-purpose cleaner that is so versatile and powerful, you will wonder how you ever got along without it. It will clean and remove stains that nothing else will, and will often produce results that can only be described as amazing. Use the paste full strength to remove gum, tar or wax, clean your boat, remove stains from clothing and upholstery, clean grease stains in the kitchen, remove spots from carpets and so much more. Because it's concentrated, a little Quick'n Brite goes a long way, and a single container can last for a long time. Just use as much cleaner as the job calls for, and always start with a small amount. Tough jobs will require more, but easy jobs like windows and mirrors take just as little as a single teaspoon mixed into a quart of water. Try it for yourself and you will be amazed at how well it cleans. Plus it's harsh chemical free and totally biodegradable, so you can feel confident when you use it, knowing that you are not posing a risk to yourself, anyone else in your home, or the environment. This powerful paste not only cuts the time you spend cleaning, but it also saves you money. You will no longer have to purchase a special cleaner for every job around the house because Quick'n Brite is all you need. One container can replace dozens of household cleaners you use everyday, and the same quantity will last ten times longer in many cases. Dilute it into water to replace all of your cleaning products under the sink, and build a cleaning arsenal that can defeat any dirt or grime you encounter. Just 1-2 teaspoons will make a quart of window cleaner that works better than the blue stuff, and three tablespoons into a quart of water will make a super strong, all-purpose cleaner that you can use all over. Quick'n Brite is strong enough for all of your toughest cleaning chores, yet completely biodegradable and environmentally safe. It contains no toxic chemicals, does not produce harsh fumes, and can be used with complete confidence around children, pets and food. When you are not guessing about which product will work on the current mess you reduce time needed, and when the cleaner you choose works the first time, you save even more. Because this one is incredibly effective and also highly concentrated, you can use way less to get the job done, and that will save you money. WHAT CAN BE CLEANED WITH IT? Apply full strength to take wax or gum out of carpeting. 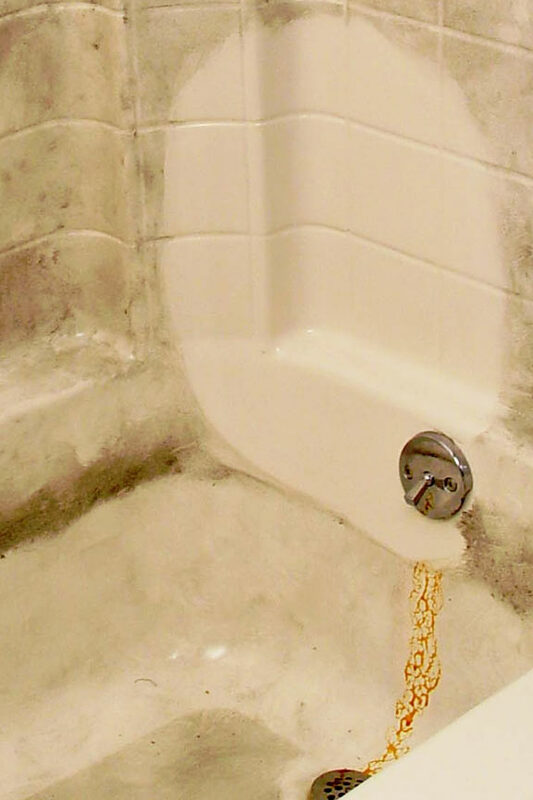 Clean bath tubs and showers no matter what the surface type is. A safer alternative that doesn't stink, but does actually work. Pre-treat laundry stains to eliminate dirt, mud, grass, blood, crayon, ball point pen, oil stains and more. Use on carpet stains to spot clean and remove staining without any worry of bleaching out color, or leaving behind a residue. Clean dirt from leather shoes or couches, and condition the material at the same time. Take thick black soot off of natural stone or brick without resorting to harsh chemicals or acidic compounds. Use on vehicle rims to remove brake dust and road grime. Safe for nearly any surface, and effective for virtually any type of dirt. Check out the Cleaning Guide to discover a hundred other jobs it works on too! 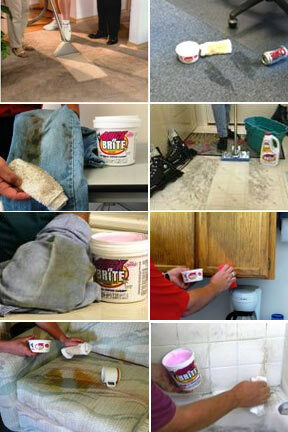 Quick 'n Brite is so easy to use, it will make all of your cleaning jobs a breeze. It is perfect for windows and mirrors, greasy stove tops, tubs and showers, upholstery, floors, clothing, walls, carpet, tires and wheels, plus so much more. It is one of the only natural cleaners to be truly effective as well as amazingly versatile. It contains no toxic chemicals, cleaning solvents, or harmful abrasives, and gets its tremendous cleaning power from a natural surfactant making it totally biodegradable and environmentally safe. It has been tested by an independent lab, which concluded that the product was biodegradable and non-toxic. This means that it is entirely safe, and it also requires no special handling like so many other household cleaners do. There are no toxic fumes to breathe, and it won't irritate your skin. 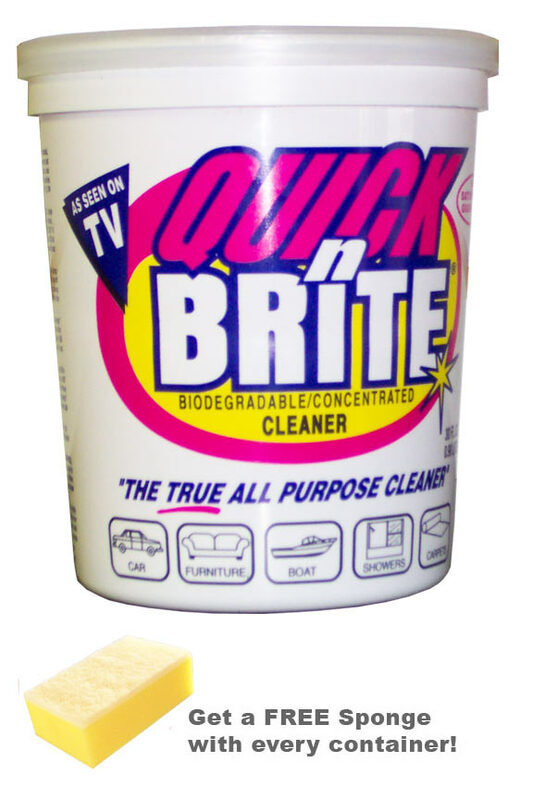 Quick 'n Brite is safe around children, pets, food, and will do no harm if it works its way into lakes and streams. Discover a greener way to clean. Order Yours Today! 30 oz Quick 'n Brite Paste - Clean anything you can get wet with water! This is a highly concentrated, environmentally safe (phosphate-free) organic solvent for all your cleaning needs. Whether cleaning floors, autos, windows, or even your pet, it is perfect for any job! This product is the best. I have been using it for 20 years. Cleans stains other products can't touch. This products cleans darn near everything with little effort. No greasy residue very impressed. So happy to find the "pink stuff" and for such a good price. We have used this stuff for years and love it! Thank you! Great product! Cleans everything really well! I use this and will forever recommend it to anyone who will listen!!! I wish this product was available at every local store! Have been using this for over 20 yrs. So excited I found it again through this site. It takes out even blood off a White shirt. The product is great, and fast delivery from this company. quick n brite is changing my life! I ordered it to try and get purple silly putty out of a white basketball uniform and honestly, I had my doubts about it, but it totally worked!!! and I mean totally, you can't even seen where the silly putty was!! (and remember, it was PURPLE silly putty on a WHITE basketball uniform!!) I also used it to get a spot of blood out of a blanket that had already been washed and dried, and it totally worked!! I also had something boil over in my oven that was a huge, gross mess so I smeared quick n brite on it and let it sit all day and then was able TO WIPE UP THE WHOLE MESS WITH A PAPER TOWEL!! I don't know how I hadn't heard about quick n brite before, but it's changing my life and I have been telling EVERYONE about it!! I've used Quick n Brite for 25 years. It works wonders on dog accidents in the house and for laundry stains. It has many uses but these are the two I use it on most. I highly recommend this product. It's an Awesome product. I have ordered this product 25 years ago. I knew how great it is..just awesome. You will not regret trying it. A five star. Glad to find this Quick n Brite again. Had bought some many years ago, and did not know if it was still being manufactured. It is the most amazing cleaner, mixed with boiling water to make a spray bottle of it. Love it for my carpet spots especially, and anything else like sticky clothing stains/spots, etc. And my last tub of it lasted me for at least 15 years! Thanks for having it available. I ordered this after finding the article online explaining how it removes silly putty from clothes. It absolutely does! I was thrilled. I was disappointed, though, that it didn't do anything to hard water buildup (even though that is suggested as one of the uses). Still, I am sure this will be well worth the expense of ordering it in Canada. it works nicely on windows that are in fairly good condition. it is not a miracle product and i still have windows that i can not see through. I tried standard cleaners, which didn't get all of the black stain from my wood stove chimney thimble off of the brick chimney face in my living room. I tried QuickNBrite, and it did a better job, but even after two tries (following the directions) some staining on the mortar is still present. The odor from the creosote is much improved, but it is still detectable on a humid day. This product is unlike any I've ever seen. There's many tricks to get out stains but not to get out things like silly putty, but this product will do the trick. It works wonders!! Prevented me from having to throw out a lot of items that I thought were ruined. I purchased this because of all the high ratings/reviews I saw when I was looking for a leather tennis shoe cleaner. I used to buy a new pair every year (all white always lol) because most cleaners would take off some of the color which left them looking just as bad. This cleaner works exceptionally well!! My shoe laces are white as can be and my shoes look brand new! I love it!!! It is the best ever. I had a half of a gallon before my mom gave me. This is amazing I just use it on stains on laundry. I have used other so called stain removers but this one is the best out there. I love it. My husband works with grease & this is the only cleaner that works on grease along with a lot of other stains. This stuff really works, thank you for a great product. Very versatile product. Cleaned carpet very well, removed stains and odors. Diluted it for cleaning bathrooms and countertops. Love it. I have to have this product in my cleaning arsenal--it does everything! What I particularly like is that it is gentle, but effective. I have used it to clean painted walls, fabric, the exterior of our boat, showers and tubs, and many other objects. I have never used another product that has so many uses. I used it thinking it would clean the brick in my fire place. It did not work at all. I am SO happy to finally have found one product that does it all! Quick and Brite is my go-to for everything. I really don't know how I survived without it before my purchase. Thank you so much for making it available to me. I have used Quick n Brite Paste on stains on my clothes for years. I actually spray on Zout first and then brush on the quick n brite. it takes out many stains that were missed and the clothes went through the dryer. I first purchased Quick n Brite at the Texas State Fair. It's one of the best products on the market for all around cleaning. I've used it to clean my leather couch, shower scum on glass door, as well as carpet stains and clothes. I've also used it on my wood cupboards with success. This is a fantastic product--well worth the price, but more importantly the quality of product is fantastic. I had not used this product for over two years and it still does the job better than other cleaners. I have been using QuicknBrite paste for over 20 years. It is a fantastic and safe cleaner for everything, even delicates. Couldn't do without it! I originally purchased this at the Iowa State Fair several years ago. This paste takes out impossible stains. I had red wine spilled on my white pants and after having it in my sink for a couple of days with it taking on a purple color, I decided to go for broke and threw it in the washer. I was amazed when it came out stain free. Gave some of this to a friend who was having trouble with grease and oil stains, and he wanted to know where to purchase a tub of his own! as advertised. quick delivery and lowest price. The only reason I bought this was to get putty out of an expensive quilt after my son left his putty on his bed. ?? It took two washes an scrubbing this into the quilt, but it worked! I'm going to try it in my carpet cleaner next. My intention was to use this product to clean the fireplace BUT I found out it cleans the grease out of the kitchen effortlessly, also used to clean the grout on my Mexican tile with little elbow grease. I also removed stains from a sweater, now I'm a believer, this product works great AND I do not have to wear gloves. I may be buying the larger container next time. It worked very well used on leather recliner that was stained from sunscreen .No other leather cleaner could remove the stains.They are mostly gone after one treatment. It sure will. 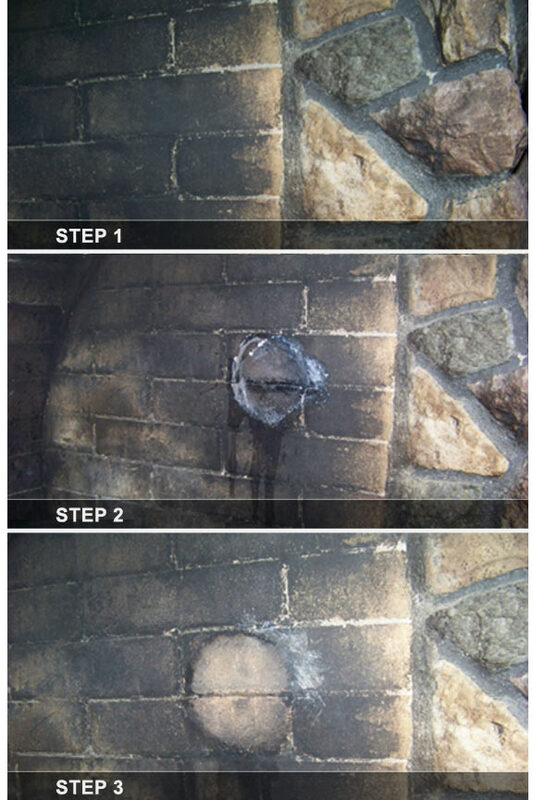 A simple technique will give amazing results when cleaning black grime off brick around your fireplace. Read more about it: Cleaning soot from brick or stone. 8 of 10 Customer(s) found this Answer helpful. I would like to revive a fairly expensive leather ottoman that was stored and is now encrusted with dust, dirt and probably some mildew. Will this work for the job, and what would you recommend for a leather conditioner once it's cleaned? Thanks! Yes it will work. As an added bonus, no conditioner should be necessary because this stuff conditions and cleans at the same time. Yes and yes. It will be safe and effective for sweat stains on synthetic fabric, but you can also use it to remove tough stains from any other fabric too. I noted that my container indicates that Q&B (from the infommercial days long ago) used phosphates. Is that still the case? The company and container nonetheless says that it's 'environmentally friendly,' etc. Your info indicates enzymes, instead. Bookmarking, I look forward to doing business here! Thanks! How much do I need for one application to clean the soot from the inside of a firebox with clay fire brick (about 30 sq.ft.)? Are there any retail stores that sell it in case I run short? It's hard to say for sure, because severity and other factors will come into play, but in most cases, a single 30 oz container would be plenty for this job. It would be pretty tough to find more locally, so if you want to play it safe, just go for the 80 oz, and keep the leftovers to use on the hundreds of other jobs it's good for. I have a very small stain on some pants for "dry clean only." Safe enough to try? Sorry about the last messages queries--your answers are "yes!" I've noted that the product--even dissolved and bottled--lasts for years--maybe decades! (It's outlasted one of the company's spray bottles from its infommercial era!) Look forward to doing biz here for a long time! It should be totally safe for this job, and will probably lift your stain in a matter of seconds. The savings over having the dry cleaners do it will be staggering. My husband leans back on the recliner and uses lots of hair spray on his hair and now we have a buildup of hairspray on the back of the recliner, will this work to remove it and is the liquid or paste better for this job? It will definitely work for this job. If the material is not leather, just spray on a heavy solution. If it is leather, use some paste on a damp cloth. One of our volunteers accidentally flicked some of the product in her eye. We have flushed it out with an eye solvent. Should we do anything else? Your volunteer will be just fine. A quick rinse with water is typically sufficient due to the safe ingredients used. Will it clean extra hard water stains off of outside windows? Can I buy Quick n Brite locally? Like in Detroit, Mi or in the big box stores? You won't find it in stores locally, but we ship it quickly, so you can have it within a few days of ordering. I'm considering resurrecting my old Floormate--I'll DIY- attempt to install new motor--or, perhaps invoke a vacuum repair place. Some say that I can use Q&B instead of mfr. detergents for that. I refuse to use mfr. detergents for Floormate anymore. Is Floormate's resurrection worthwhile? I'm cheap--I won't buy a new or otherwise pricey (commercial) machine. I do own Hoover's carpet cleaner ("Spinbrush") as well--will this work in place of the hard-surface cleaner intended for that, as well? (No hardwood flooring here.) What about Q&B in place of consumer-machine carpet cleaner, as well? Using that instead would be a great boon, too! (I'd prefer to use the Floormate instead of the Spinbrush for my more limited hard flooring.) Very naturally, Hoover insists upon their own detergents (very likely which they don't make). It's excellent as a carpet cleaner, and it will easily outperform any of the recommended versions. You can add it to any steam cleaner, or carpet shampooer, and it will work incredibly well. If anything, you'll want to add less than what is called for. Your Hoover will not break if another product is used, so give Quick n Brite a try and you won't be disappointed. Would this clean dirty stain grout on my tile floor? Will it remove very old mineral deposit build up? Would it be safe for use on a pinball play field ?